Me and those darn protein pancakes. Last week I showed you guys a protein pancake that happened when I really wanted chocolate chips but didn’t have any so I threw in blueberries. The pancake recipe still needed work and I wanted to continue working on it because, even though the consistency wasn’t the best at the time, I really enjoyed having blueberries in the pancake. 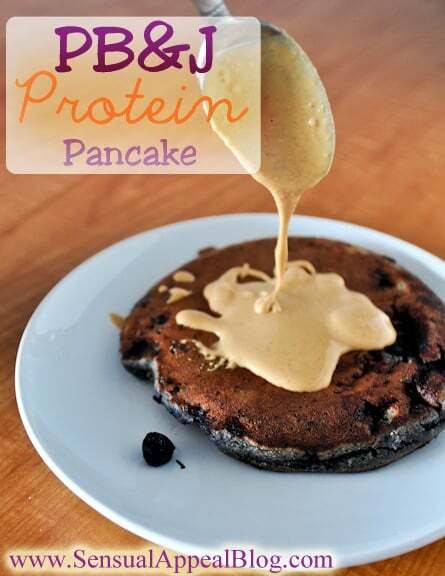 So here I am again – made another try and this time, the protein pancake was a success! I thereby present you with PB&J protein pancakes! I called this pancake a PB&J even though there really is no jelly here but I think the blueberries are a great substitute for the jelly. You can pretend like that’s the jelly part of the sandwich and the PB2 acts as the peanut butter. PB2 really is a kind of peanut butter except lower in fat and I actually prefer it to regular peanut butter. 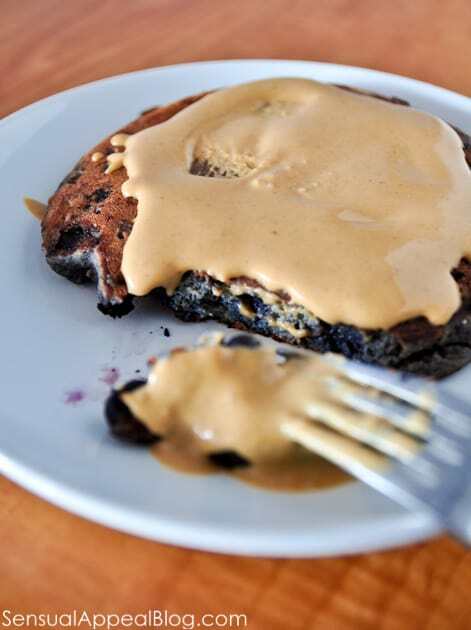 All in all, this pb&j pancake is like a healthier peanut butter and jelly sandwich. Except it is in a form of a pancake. 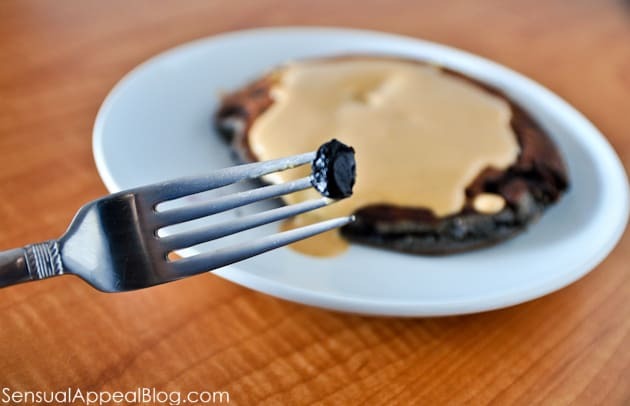 But not just any pancake at that… it’s a protein pancake. Yum. these look great and I love the addition of blueberries in there! such a different and delicious twist! Well hello mouth watering photo! I am so jealous, I am pretty hangry right now! LOL! I’m sitting here sooo hungry and seeing these beautiful photos only makes it worse 🙁 I love pancakes and definitely consider them a treat. Since I can’t make them daily, a breakfast consisting of a huge plate of pancakes always feels so special. PB and J in pancakes = love! We used to have grilled PB&J all the time growing up… this reminds me of those. but much healthier. There’s nothing like warm PB! I have yet to make an actual warm PB sandwich but I saw those grilled PB sandwiches around blogs and they look soooo mmmmmmm! PB&J makes me happy. Pancakes make me happy. And protein does too. These are a must make Kammie!! Oh mannnnnnnn looks insanely delicious!!!!! Seriously, we are meant to be friends! You have an entire section dedicated to pancakes! I could eat them for all three meals! Amennnn sistah! 🙂 We are speaking the same language!